Since the Horizontally-Opposed Engine is structured with the pistons mounted horizontally, it has a lower total height and is more compact and lighter than an in-line engine or a V engine. This allows for level cornering and more stable high-speed driving, thereby helping to realize the SUBARU ideal of enhanced driving safety. The pistons in an in-line engine or a V engine generally move vertically. However, in the Horizontally-Opposed Engine, the opposed pistons move horizontally and the opposing forces cancel each other out, thereby reducing the amount of vibration and providing a more comfortable feel to the engine. Most sports cars make adjustments in the suspension system to ensure roll stiffness. 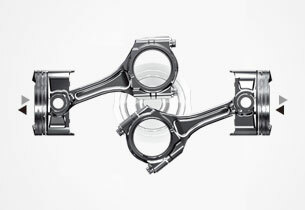 In contrast, ultra-low center of gravity packaging has been achieved by pursuing the potential of the Boxer engine and the vehicle itself rather than unnecessarily tightening the suspension. This packaging makes it possible to enjoy excellent handling with little roll, instability, bumps and vibrations for a smooth and comfortable ride. Better contact with the road surface, little roll, and fast convergence afforded by a low center of gravity create a sensation of the vehicle adhering to the road. The excellent front and rear weight distribution of 53:47* produces a direct response to steering. The enjoyment of this completely new handling can be experienced not only in limited settings such as circuits, but by anybody driving on public highways or roads with even slight curves. This is the attraction of ultra-low center of gravity packaging. Load shift reduces postural changes, making it possible to achieve both gentle motion and steering response. This ultra-low center of gravity packaging has achieved a gravitational center height of 460 mm*1, among the top class in the world*2. This provides drivers with handling that has excellent response and a comfortable ride for all. ･The shapes of auxiliary equipment have been completely rethought to give the engine the lowest center of gravity possible. 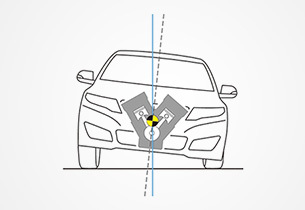 ･The driving position has been set at the lowest possible position to lower the center of gravity of the entire vehicle. ･A lightweight and highly rigid chassis has been specially designed to improve stability. ･Uses an FR layout and the pleasure of unembellished handling has been pursued to the utmost limit. 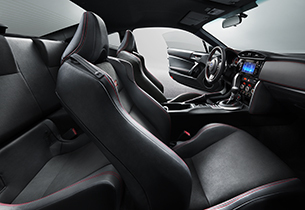 ･A light yet strong body structure that ensures optimal performance for the front, rear and cabin has been developed. 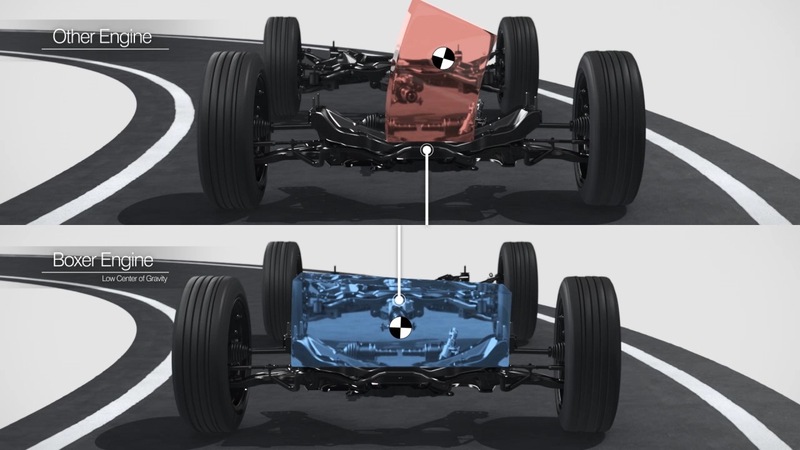 The ultra-low center of gravity packaging is the result of pursuing the advantages of the low center of gravity offered by the horizontally opposed Subaru Boxer engine to their limits. 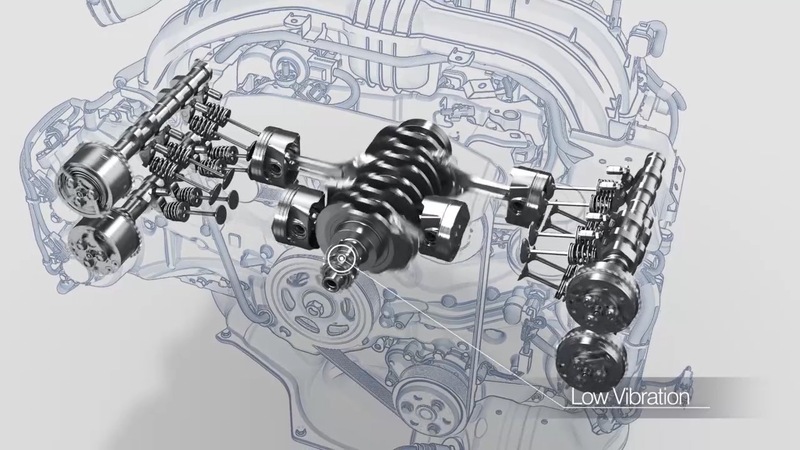 The Boxer engine, which had a low center of gravity to begin with, has been made lower and mounted closer to the center of the vehicle to truly lower the center of gravity of the vehicle overall. This previously unheard of endeavor and innovation resulted in a gravitational center height that rivals that of super sports cars, excellent front and rear weight distribution and a new dimension of driving that has never been experienced before. 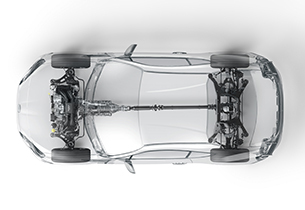 The expertise in horizontally opposed engines, technology and passion for driving cultivated at Subaru have all been poured into this ultra-low center of gravity packaging. Introducing the Subaru Boxer Family. Since being installed in the first-generation Legacy in 1989, the EJ20 has been proving itself on the front line for over two decades, and can be rightly considered one of SUBARU’s masterpieces. The development of the EJ model began with the aim to create a successor to the EA model, which was FHI’s first compact passenger car in the SUBARU 1000 era (1966) that was powered by the boxer engine. The development project aimed to maximize the already-high potential of the horizontally opposed engine, delivering high rigidity and efficiency that left no stone unturned. The EJ20 succeeded in creating a high-quality driving sensation worthy of the first-generation Legacy, which strived to be a car truly made for the driver. Since then, this engine has become the base of a wide range of engine variations. The EJ20 can truly be said to be a symbol of SUBARU Engineering’s ethos of starting with high-quality design foundations and working unceasingly to add improvement upon improvement. For the first time in 21 years, every function in this new boxer engine has been renewed to meet the demands of a new era. 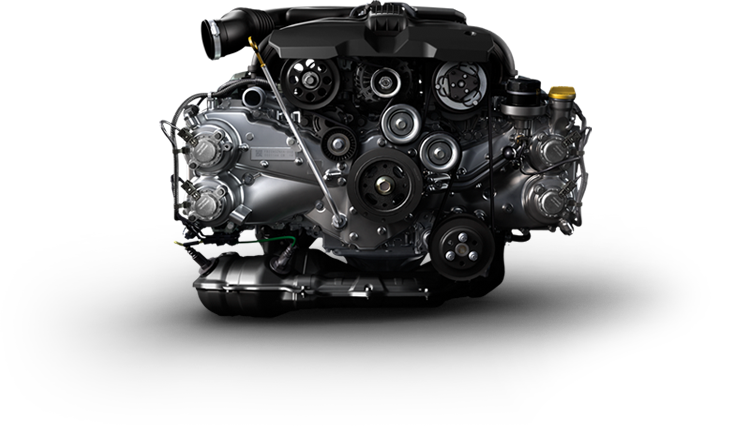 Thanks to across-the-board improvements including longer stroke, more compact combustion chambers, improved intake and exhaust efficiency due to the installation of dual AVCS, lighter piston weight, and decreased engine wear, the next-generation boxer realizes high combustion efficiency and superior fuel economy. It has also successfully realized refreshingly responsive acceleration as well through rich reserves of low- to mid-range torque. All of these improvements deliver even greater everyday usability. By achieving both a high degree of environmental performance and driving pleasure, this boxer is worthy of being called a next generation engine. This highly efficient turbocharged engine offers well balanced specifications for the entire car, including in terms of power, fuel efficiency, fuel type, and displacement. Equipped with direct fuel injection and Auto Stop Start System, this engine delivers high power without the feel associated with a small-displacement engine and great fuel efficiency without the feel associated with a turbocharged engine. SUBARU’s next-generation turbo engine is also cost-efficient since it uses regular gasoline, and the engine has good touring performance. The FA20 builds on the base of the next-generation boxer engine’s design concept to develop a new normally aspirated engine, which aims for higher output and environmental performance as well as an even lower center of gravity. In addition to squaring the bore and stroke, the FA20 also incorporates the next-generation “D-4S”* direct injection technology. It has also realized output performance of 100 PS per liter, as well as low fuel consumption and cleaner emissions. This engine, with the attention paid to aspects such as the engine note transmitted to the vehicle cabin, allows you to experience the enjoyment of the boxer engine to the fullest. The FA20 DIT is based on the next-generation boxer “FA20”, and in a first for SUBARU, introduces Direct Injection turbo technology. Thanks to improvements to the knock resistance threshold, due to the adoption of direct injection as well as precise fuel injection control, the FA20 DIT has realized a high compression ratio and high efficiency that would have been impossible for previous turbo engines. Despite being a 2.0-liter engine, the FA20 DIT boasts dominant sports performance, which surpasses large-capacity turbo engines, and unbelievably low fuel consumption and low exhaust emissions from that power. It is fair to say that the FA20 DIT offers the performance of a truly next-generation sports machine. The world's first commercial Horizontally-Opposed Diesel Engine developed for passenger vehicles is the SUBARU BOXER DIESEL. When petrol engines are converted to diesel, strengthening of the engine block usually makes the engine bigger and heavier. The SUBARU BOXER, however, was originally designed with rigidity in mind, allowing the 92.0 mm x 75.0 mm bore and stroke of the 2.0-litre petrol four-cylinder engine to be changed to a square 86.0 mm x 86.0 mm design. The result is a more compact combustion chamber and greater fuel efficiency, and combined with a higher pressure common rail fuel injection, an improved oxidizing catalyst with closed Diesel Particulate Filter (DPF), a variable nozzle turbo and electric power steering, these all help to reduce fuel consumption and CO2 emissions. Ceramic glow plugs also quicken starting in cold weather. And whilst meeting the ultra-clean EURO5 emission standards, the engine delivers even more torque compared to previous models. A prodigious 350-Nm of peak torque is delivered at a lower 1,600 rpm – providing smooth, free-breathing performance at any speed. These advantages are evidence of the vision that Subaru has in using the Horizontally-Opposed Engine. 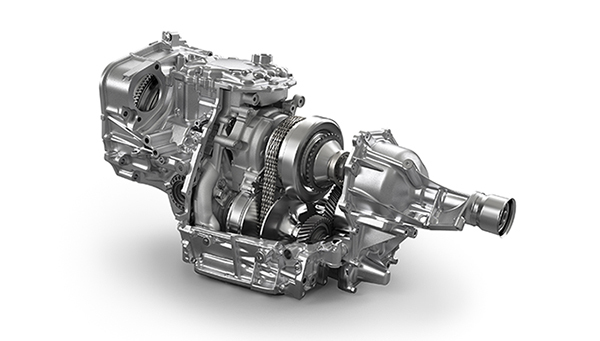 The vertical chain continuously variable transmission known as Lineartronic is Subaru’s unique next generation CVT transmission and is featured in a great number of models. It will achieve superior fuel efficiency by not only continuously selecting the most suitable gear ratio, but also constantly using engine efficient operating ranges such as the lower range. Other features of Lineartronic include linear response to the accelerator, a smoother ride without gear shift shock and quietness. Designed in pursuit of a light and compact design. By adopting direct control, quick response to gear shifts and a smooth feel have been achieved. 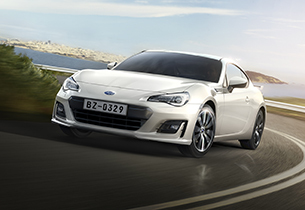 Downshift blipping control featured in the SUBARU BRZ enables smooth gear shifting by synchronizing the engine speed when moving into lower gears and increases the enjoyment of driving a sports car. The vertical transmission available only with symmetrical AWD achieves a superior feeling of moderation and rigidity. The gear ratio is set at the level that maximizes fuel efficiency and driving performance. Subaru raises the level of enjoyment of driving and controlling a vehicle by individually developing the MT for each car model.